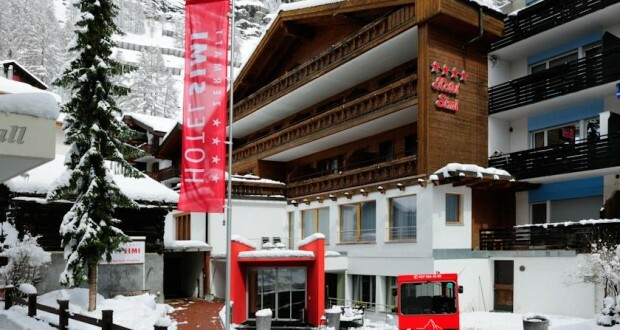 The Hotel Simi enjoys a quiet location, about 330 yards from the Zermatt train station, and offers a spa area with a sauna, a steam bath, a whirlpool and a solarium. All cable cars, ski lifts and countless shops and restaurants can be reached within a short walk. The lobby bar with an open fireplace invites you to unwind after a day out in the fresh mountain air before spending a peaceful night in your spacious room. The mountain restaurant Simi in Furi, about 5905 feet above sea level, serves authentic Swiss and Valais specialties and delicacies from the grill or hot stone. Whether you get there on foot, skis, snowboard, snowshoes or by bike, the Bergrestaurant Simi is always a good choice.